Ancient China took on Chinese characteristics during the very ancient Yangshao period (5000-3000BCE). Villages centered on farming had grown along the Yellow and Yangtze rivers, and their remains show big differences between sizes of buildings and amounts of goods in graves–China’s traditions of communal living and honoring elites were emerging way back then. 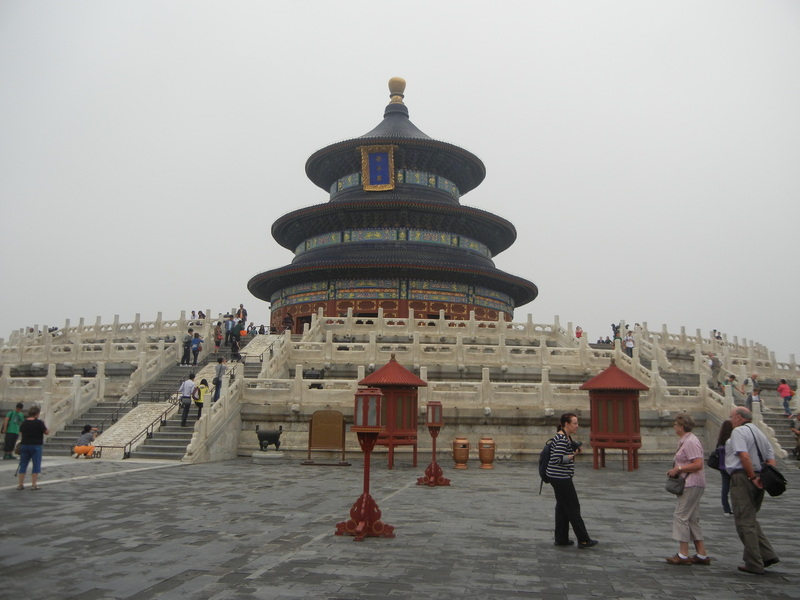 So were other aspects of Chinese culture, including ways that women have been treated and religious life. 1. Zhang Zhongpei, in The Formation of Chinese Civilization, wrote that women became subordinate to men during the period and that the patriarchial social structures (a main pillar of Confucianism) was becoming established. 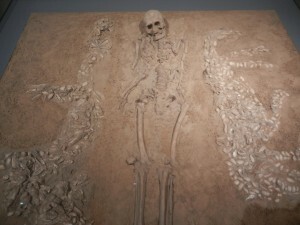 When couples were buried together, the man was often given more space, and he had more burial goods. Some graves suggest that labor was becoming more specialized–men had the stone tools and women took their spindles into the afterlife. 2. 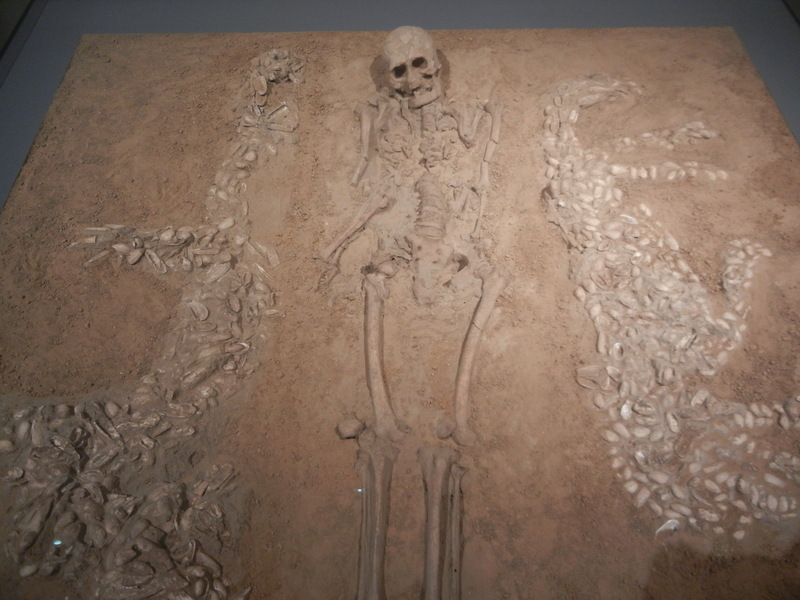 Many burials like the one above have been found in several cultures during the Yangshao period. On the man’s right is a figure of a dragon made from clam shels, and a tiger is on his left. Deer were made in some other graves. K.C. Chang thought that these people were shamans. Not everyone is sure that they were shamans, but all 3 animals have been sacred in China, and they might have energized the soul and/or helped it move between heaven and earth. 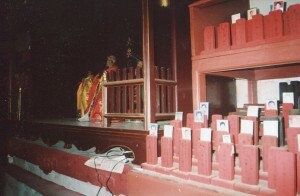 David Keightley, in his article in Heritage of China, wrote that heads of main lineages could access their own ancestors without an independent class of priests. Each strong man in the community was his own priest–a striking difference from Vedic India. This focus on intimate relations with ancestors and with the most sacred animals suggests that people even in the Yangshao period had a sense of continuity between the living and dead, and of harmony between the main powers in nature–more roots of Confucianism, and roots of Daoism. When the Erlitou and Shang cultures emerged in the 2nd millennium BCE, the most powerful lineage heads had become emperors who ruled large states. They kept their priestly functions and their rituals were supposed to harmonize the state. Beijing’s Temple of Heaven (above) continued this tradition of seeing continuity between earth and sky, and the emperor as the state’s high priest. 1. Tightly knit villages centered on farming. 3. Patriarchial families with a subordinate status enforced on women. 4. Assumptions that nature is continuous. 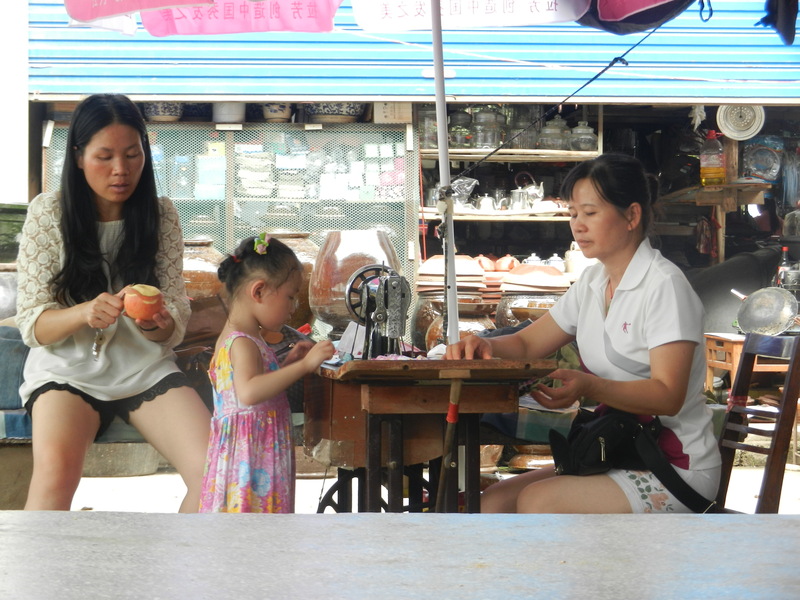 Families and their ancestors remain in close contact. Nature and society form a whole. Many Chinese still honor their departed relatives in their homes and temples. The above shrine is way down in Malaysia, in Malacca’s Chinatown. 5. Art that stresses harmony and balanced patterns. 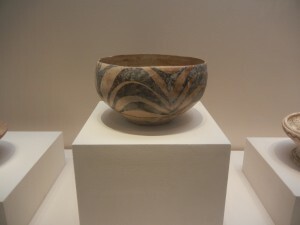 The first bowl in this post, and several in Yangshao, Part One, depict balance between dark and light colors and graceful transitions between them. 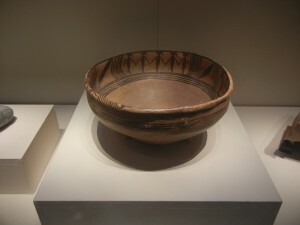 Yin and Yang energies weren’t systematically written about until the late first millennium BCE, but many people seem to have thought in terms of balanced energy flows by the Yangshao period. 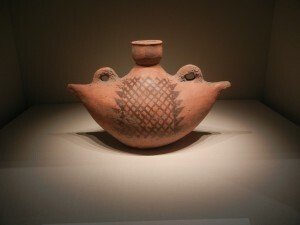 this ewer in the shape of a boat, with a net design, express a world in harmony, which is patterned in balanced forms. 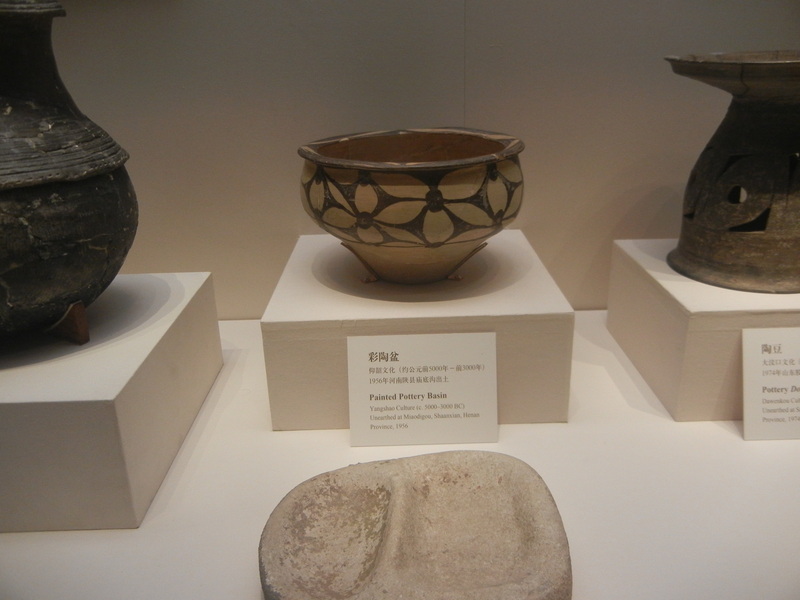 Chinese ceramics continued along this path, but it was already well on it in the Yangshao era. This bowl from a late Yangshao period culture called Majiayao has lines of 5 dancers on the inner rim holding hands between wavy lines that resemble grains in the breeze. Some other ceramics in several Yangshao period cultures have a carved pig’s face. All these ceramics stress balance more than the abundance in a lot of Indian art. They seem to reflect communities of people and ancestors living in a unified field which is stable and harmonious–ideal conditions for emerging agricultural societies. Their subjects express the natural world and communal life more than cosmic vastness that dwarfs human beings. People in China were already developing standards of beauty that are in human terms.